If anyone is maintaining a list of phrases that just don’t make sense please add “hot and fast BBQ brisket”. That just goes against everything anyone ever suggested. In this context though hot means 300F and fast means around 7 or 8 hours so it’s not as crazy as you might think. Not much to a Texas style BBQ brisket really. A simple rub, meat and smoke. Sauce is to hide failures. Intricate rubs just aren’t Texas. Smoke – that’s the secret ingredient. It’s tough to pull off though. Probably the hardest thing there is. Pulled pork is very forgiving. Ribs maybe a bit trickier. But brisket – brisket is tough to nail. This approach makes things easier but if your friends don’t already tell you your pulled pork is the best they’ve ever had maybe you’re not quite ready to take on BBQ brisket. It’s expensive and it’s really not very good at all if you miss. It’s 50% kosher salt and 50% 16 screen crushed black pepper by weight. I have no idea what screen corresponds to but coarse is what you want – some call it butchers pepper. If you want to go really crazy you can add a bit of granulated garlic and onion. That’s it – and I think the garlic and onion are overkill. Serious overkill. Costco coarse black pepper is a nice grind size for this. Diamond Crystal kosher salt is roughly the same size so they work well together. I burn lump charcoal and I like Dragons Breath best if you can find it. It’s a mix of oak and hickory. It just smells like Texas when it burns. Really. Maple Leaf is a mix of beech, birch and maple – it’s not the same but it’s pretty good too. This technique works for the flat. I haven’t tried it yet with the point. If you have no idea what I’m talking about, the whole brisket has two pieces. The flat is leaner and flatter, the point is fat and delicious. I will try a point prepared this way before too long. Whole brisket 15 hour smokes are for the truly dedicated and while I admire them this works for the rest of us. 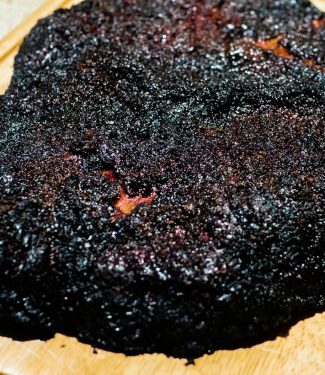 Nothing can touch a brisket when it's done right. Cover the brisket generously with the dry rub. Make sure you have butcher's paper handy to wrap. Ask your butcher for some. Set your smoker up to cook at around 300F. I bet, if you were careful enough, you could do this on a weber kettle but it's easier in a smoker. Trim your brisket if needed. Please, please, please leave at least 1/4 inch of fat minimum on it. Fat tastes good. Trust in Julia Child. Her words, not mine. 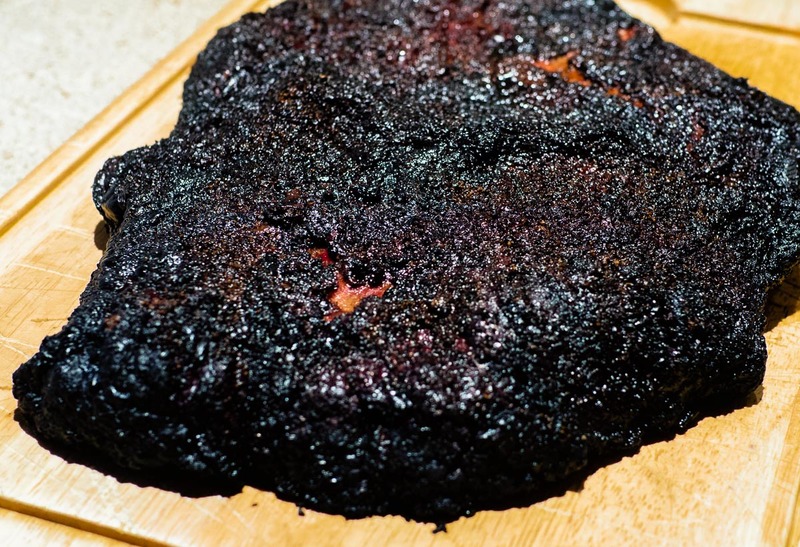 Season your brisket liberally with Aaron Franklin's secret rub. Smoke the brisket fat cap up for 4 hours. At this point check the internal temperature. It should be somewhere around 160-170F. At this point wrap your brisket in butchers paper and continue to cook fat cap down until you get to an internal temperature of 195-200. This is another hour or two max. You are looking for probe tender. Google it for details but a lot of BBQ forums talk about the faux cambro. This is an easy way to keep your BBQ brisket hot if your timing doesn't quite work out. All you do is take a cooler a bit larger than what you are trying to keep warm and pre-heat it by filling it with hot water. You wrap your meat so it doesn't leak and fill the empty gaps around the meat in towels. Make sure you don't use nice towels. Try as I might I always have leaks... BBQ scented towels. Is that really a bad thing?